Obama lost by a 98-1 vote. The Senate will review any nuclear deal with the Ayatollah of Iran. 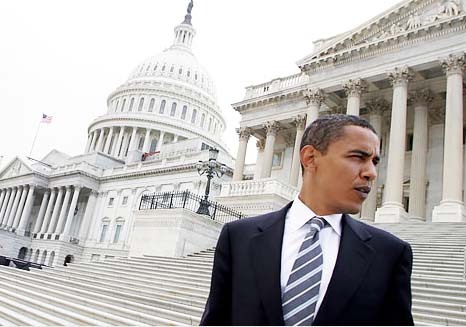 Barack Hussein Obama has hardly any support on Capitol Hill for his New Age policy towards Iran. A key bill to increase congressional oversight of a future nuclear agreement with Iran passed the Senate by an overwhelming majority of 98-1 Thursday, in a move that could limit President Barack Obama’s room for maneuver in negotiations with Tehran. The bill will allow Congress a 52-day review period of any agreement that the US reaches with Iran over its nuclear program in the framework of ongoing talks between Tehran and the six world powers. It will also require regular reports from the president on the progress of Iranian steps to scale down the nuclear program, and will curb the president’s ability to negate Congress-imposed sanctions by signing repeated waivers. It is likely that the American nation will survive eight years with Barack Hussein Obama as their leader. It is not likely that any capital in the World will survive a nuclear attack by Iran. You simply to not give radical Islamists the permission to develop a bomb. If they try to do it, you will have to stop them. The lesson from the Iranian Revolution of 1979, is that Islamic terrorism has been institutionalized. Tehran is the epic center of support for Muslims who cripple and kill for “allah”. The only reason for why Iran is “peaceful”, is that all opposition has been removed. Christians has simply disappeared. Those who want to revoke the priestly dictatorship, has been hanged or beheaded. The Senate has been able to discern Obama. Also his fellow congressmen in the Democratic party. They do not trust that Hussein Obama do not have the American peoples best interested in mind, but acts in loyalty with centers of Muslim powers over seas. Many Christian leaders have claimed that Obama is a “Christian”. Shame on all who accepts this falsehood. They have no discernment, and do nor represent Jesus of the Bible. Son of the moon god allah. This is the whitewash effect. The government lays all the negativity on the outgoing president, then sends the scapegoat into the wilderness. Washington is clean again, for the next go round. Dear Ivar, I don’t think we will survive Obama. I also think the republican’s are putting on a show, acting like they are against his policies. I heard it explained as the “Three legged stool plan”, Rick Warren’s plan. We are in the one world government, the pope is coming to America and they will kiss his ring. Did you hear about the ‘Jade Helm’ they are going to do July-Sept. Military on the streets in the USA, who would have ever heard of such a thing in the last 2 generations? Pray for the peace of Jerusalem, and I pray, “Lord forgive America for turning against your people, we don’t deserve mercy, but I pray for it”, I love Israel and I love God, Israel’s God Jehovah and Jesus Christ who is God in the flesh, even though they don’t recognize Him yet, they will. As the Jews are gathered in unbelief, I pray for their salvation so they can become members of the church. Colossians 1:12-19. Shalom! I don’t think we will survive Obama. I also think the republican’s are putting on a show, acting like they are against his policies. The Republicans seek power. To get a majority, they are in need of the votes of the Roman Catholis. RCC John Andrew Boehner is their majority leader at Capitol Hill. They call him a “cafeteria Catholic”. My best guess is that he is not a regular Church going Catholic. Politics are mucky business. The Word of God is the truth. Both the Democrats and the Republicans will eventually betray Israel. When I said that the “USA will survieve Obama”, I compared the rule of Obama to a nuclear explosion. I am still convinced that the USA will not be physicaly destroyed, before Obama’s term in over in the White House. Relatively few years ago mankind decided to throw away their bibles and believe in the theory of evolution. They said we don’t believe in no God or bibles, we believe in science. So God put the theory of relativity in Einsteins head, and opened the door to nuclear weapons, for mankind to blow itself up with. And here we are still looking for someone to do it. Ed Jones Einstein was an agnostic non believer. God would not have put information in people’s heads to destroy human kind, only the devil would do that! He hates us! He is fulfilling Isaiah 21 as the “treacherous dealer” who will make the call to Vladmir Putin and end ALL THE COMPLAINING of those exposing his behind the scenes deal doings of his Iran nuclear agreement of Isaiah 28:15 and the “gay marriage” vote in the Supreme Court, etc, etc! Those “whirlwinds from the south” have ravaged the southwest for FOUR consecutive days, May 6-9, with a tropical storm from the “south” about to hit our east coast! Yeshua said there would be 10 days of tribulation, will he ‘make the call’ on Israel’s birthday, May 14 to destroy eight American cities? Will the remnant be standing before the Messiah and “cut off” from antichrist on Shavuot/Pentecost May 24, 2015, for a “time, time and half time’ Revelation 12:14-17.